This may be an unpopular opinion but if we were lucky to come face to face with one of these majestic horned creatures, we wouldn't immediately ask to touch their horn— we'd want a piggyback ride instead. Hear us out for a second before questioning our sanity. We've heard that riding on a unicorn's back is pure euphoria. It's an activity we couldn't pass up. This child's piggyback unicorn costume attempts to create this magical and whimsical feeling because we all know that tracking down a unicorn is tough work. (We've been working on it for the past 25 years and still, no unicorn.) Get this costume and conjure the enchanting feeling all by yourself. And if we happen to finally find a real unicorn, we'll definitely send him or her your way. 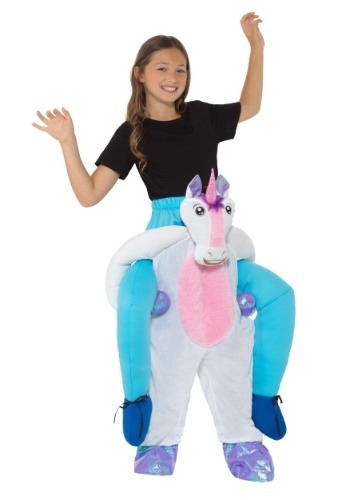 The child's piggyback unicorn costume comes in only one standard size and it's capable of fitting both boys and girls of all ages. 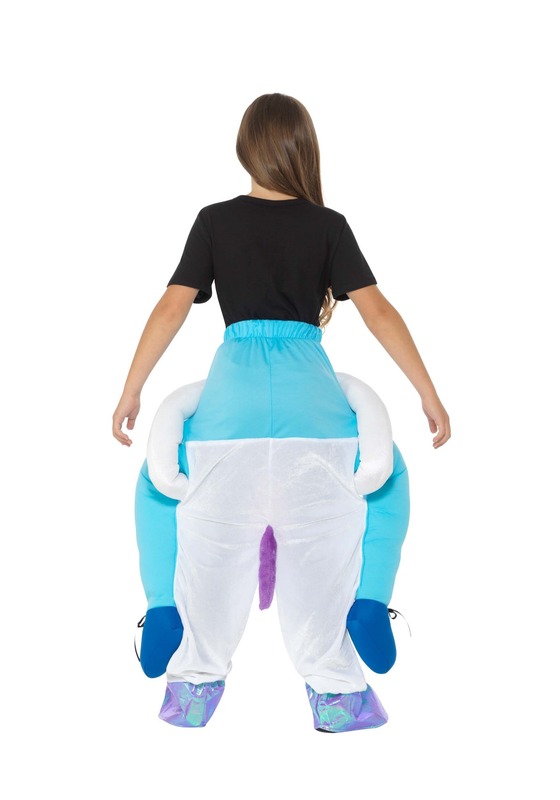 The costume consists of unicorn pants with attached plush "human" legs, creating the optical illusion that a unicorn is carrying you on its back. The unicorn has shiny purple hooves and a sparkly pink horn while the pants and shoes are different shades of blue. Pair it with a favorite t-shirt and you'll be ready to trick all your friends while making them extremely jealous too. Experience what it's like to get a piggyback ride from all different kinds of exotic creatures. We also have a T-rex and ostrich piggyback costume you can try next!